This is a page from my notebook that I carry around in my purse. The numbers look so mysterious, don't they? If I were the victim in a police procedural drama (God forbid), I hope the detectives who find these numbers on my person would not spend too much time on it because it would turn out to be a red herring. No, these numbers do not correspond to contacts and paymasters in an espionage ring. Nor are the numbers dates, locations and casualties of past and future disasters. These numbers will not lead them through a high-speed chase through the capitals of Europe and the Middle East in search of The Holy Grail. (So the cops can rule out an assassination backed by the Vatican.) Did I become a bookie and are each set of numbers a person who owes me money and I just got "mixed up with the wrong kind of people"? Bernie Madoff's Swiss/Cayman Island bank account numbers? The by-product of late onset schizophrenia? The truth can be so prosaic. These numbers are International Standard Book Numbers -- ISBNs. Starting in February this year I embarked a de-accessioning program with my personal library. I wanted to find good homes for my books so I started listing them on Amazon.com. My problem was, and is, that I have a 10-year-old Mac at home and it takes several hours to upload 20 ISBNs. So I decided to write down the ISBNs of the books I wanted to sell and upload them on my computer in my studio where uploading 75 books can take as little as 15 minutes to do. I'm not getting rid of my entire library, just paring down. I want the books in my personal library to be there not just because of content but also as an artifact. I think I'm done buying paperbacks. I am hanging on to my art/photo books. As well as reference books. In the meantime, I have been patronizing the Boston Public Library which is a civic treasure. I look up what book I want on their database, request it online and then they send me an email letting me know that my book is waiting for pick-up at the Copley Branch. These are shorthand notes to myself regarding the condition of each book. I try to give an accurate description of each book to avoid unpleasant surprises for the buyer later on. Managing expectations, after all, is key to good customer service. Would you pick up, much less read, a book with this on the cover? OK, here's the actual book. 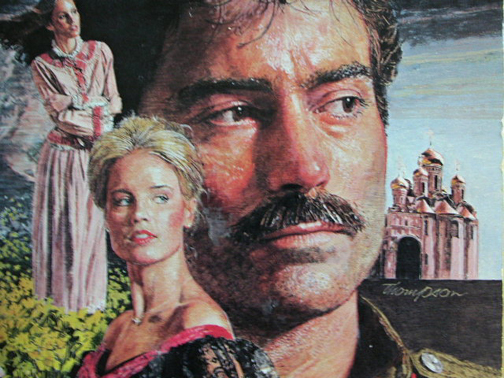 "Listen up, sales of Dr. Zhivago are circling the drain. We're getting our lunches handed to us by Anna Karenina and The Brothers Karamazov. Granted our buddy Pasternak is no Tolstoy but still, there was a movie made from this book. It should be able to hold its own." "Maybe we should get Dr. Zhivago on more college reading lists?" "Smithers, not even God almighty Himself could influence those commie literature professors. Think free market, Smithers. It's our only weapon." "How about we appeal to a completely different segment of the market?" "What's that, Johnson? What different segment?" 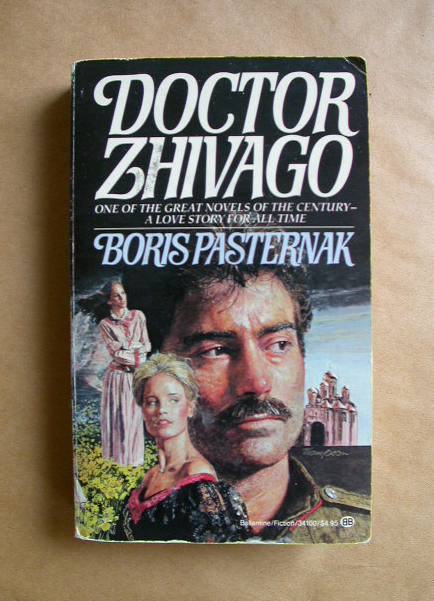 "Well, Dr. Zhivago is kind of like a love story, right? What if we appeal to our romance readers? Our sales are going through the roof with historical romances. We can't churn enough of that stuff out." "Johnson, let me tell you something about myself, I don't read pinko writers. I just sell the books. But you might have something there... get me the art department! I want a romance cover on this book ASAP! Quick, who was the male lead in the movie version? "That won't work, Smithers. My mother likes Omar Sharif. We need a new heart throb. Somebody hot. New. Exciting..."
"That Kevin Kline seems to be pretty in demand these days. How about him?" "Now that's thinking, Johnson. Yes, Kevin Kline it is. And slap a moustache on him. 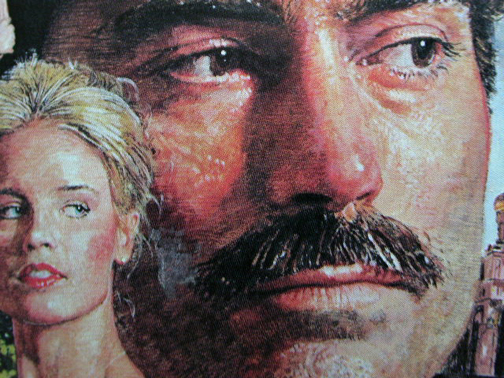 It works for Tom Selleck. We are going to make a bundle on this, Johnson. Smithers, don't let the door hit you on the way out."